AL-1 Arrival at NAS Patuxent River, MD on 5 February, 2016. 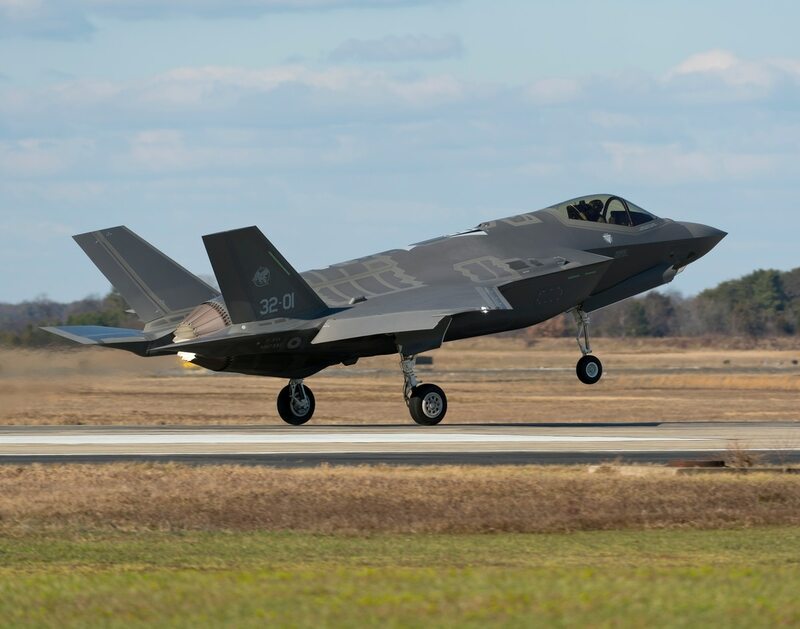 This was the first time a foreign assembled F-35 to land on US soil. HELSINKI — Unresolved issues over the funding of the Danish fighter replacement program (FRP), and uncertainty concerning the stability of Denmark's minority backed government, are raising fresh fears about further delays in the decision-making process. The Danish government promised in December 2015 that a final decision on the selection of a new fighter type would materialize in 2016, with the Ministry of Defense (MoD) presenting its fighter type recommendation during the first half of the year. The F-35A Lightning II (Joint Strike Fighter) is generally regarded as the front-runner in the Danish FRP, in a short-list of candidate aircraft that also includes the Eurofighter Typhoon and Boeing's F-18F Super Hornet. Denmark has been a partner nation in the F-35 program since 1997, contributing an estimated $291 million to the development project to-date. Defense minister Peter Christensen has identified cross-party agreement on financing as the key component to advance the FRP to the final project acquisition stage. "We need to acquire a sufficiently large number of aircraft that will enable us to cover our standard tasks and participate in international missions," said Christensen. The conservative-liberal government is struggling to achieve a political agreement on the precise number of aircraft to be bought to replace the Danish Air Force's (DAF) ageing stock of F-16s. Talks are being complicated by the Social Liberals (Det Radikale Venstre / SLP) and Socialist Peoples' (Socialistisk Folkeparti / SPP) parties, both of whom are demanding that Denmark acquires the minimum number of aircraft. The Danish Ministry of Defense's (MoD) Project Office requested bids for 24, 30 and 36 aircraft. In 2005, when the FRP commenced, the preferred number of aircraft sought by the DAF was 48. Depending on the number of aircraft purchased, the overall financing requirement cost for the FRP could run between US$2.8 billion to US$4.5 billion. According to Henrik Dam Kristensen, the Social Democrat's spokesman on defense, those political parties that believe Denmark should purchase 18 aircraft or less are misguided. "We require a sizeable number of aircraft to enforce our national sovereignty and to take part in international missions. Defense minister Christensen is correct to support the objective of acquiring a larger rather than fewest number of aircraft. Denmark also has large territories in the Arctic to police and protect," Kristensen said. The government, said Kristensen, must ensure that the existing framework for cross-party negotiations contains a strong project financing element and carefully costed proposals. A number of opposition parties, including the SPP, are robustly against the government using external funding, such as international loans, to finance the FRP. "We will not support the government if it proposes to employ external funding to finance the fighter purchase. The money must be found within the framework of the all-party defense agreement. We must only buy the number of aircraft that we can afford," said Holger K. Nielsen, the SPP's spokesman on defense and foreign affairs. The Danish government, said Nielsen, has a duty to prioritize capital spending on the country's under-funded healthcare, childcare, education and public transport systems. "In a military context, we may have to lower the scope of our ambitions. This could mean we reduce our participation in international missions. With fewer aircraft, we will perhaps not be able to deploy fighter squadrons to Iraq or Libya as regularly as we have done. Even with fewer planes, we will still be able to support NATO in its air-policing operations in the Baltic Sea," Nielsen said. Denmark remains a strong supporter of the U.S-led coalition fight against ISIL and other Islamic militant groups. The Danish government has deployed several F-16 fighter squadrons to Iraq and Syria since 2014. In response to a request from the U.S., it is currently offering to send a new F-16 squadron in addition to a 400-man special forces unit in 2016. Denmark joined the international coalition fighting ISIS in October 2014. Danish F-16s flew 547 missions over northern Iraq, dropping over 500 bombs, before the fighter jets returned to their home air-bases in Denmark for maintenance work in August 2015. The DAF's present front-line fighter fleet comprises 30 "operational" F-16 aircraft. It is unlikely that Denmark would be able to contribute on a regular basis to NATO, UN, or U.S.-led international missions if the number of new aircraft bought should fall below 30 planes. The final bill for the fighter replacement project will also need to include the modernization of the DAF's air-bases. The MoD is currently engaged in examining how many bases will be needed to support the new fighter aircraft. The task of keeping the FRP selection process, and the parallel cross-party project financing negotiations, on track could encounter further delays should the stability of prime minister Lars Løkke Rasmussen's ruling administration come under renewed pressure. The Danish government faced collapse in February when the Conservatives (Det Konservative Folkeparti), the party backing Rasmussen's minority administration, threatened to withdraw support and force new elections if the prime minister refused to dismiss Environment and Food Minister Eva Kjer Hansen, in a tenuous spat over agricultural reforms. The threat of forced elections was narrowly avoided only when Hansen resigned from Rasmussen's Cabinet.